Caitlyn Thiesen – Quindlen Law Firm, P.A. Caitlyn Thiesen earned a bachelor’s degree in Political Science from Marist College in Poughkeepsie, NY. After graduating from Marist, she was commissioned as a Second Lieutenant in the U.S. Marine Corps and attended law school at the University of Georgia School of Law in Athens, GA. 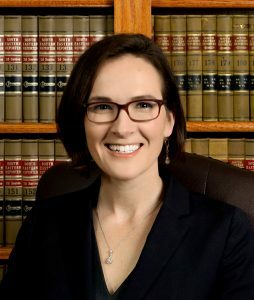 Following graduation from the University of Georgia in 2008, she was admitted to practice law in Georgia and was assigned to active duty as a Judge Advocate. Caitlyn was stationed at Marine Corps Air Station Miramar in San Diego, California, and Marine Corps Recruit Depot Parris Island, South Carolina. She served as a Legal Assistance Attorney and then as a Defense Counsel, advising and representing primarily Family Law and Criminal Defense clients. Caitlyn was subsequently assigned to the Recruit Training Regiment, where she served as a legal advisor to the Commanding Officer. Caitlyn was admitted to practice law in South Carolina while stationed on Parris Island, and left active duty to pursue private practice in 2016. She continues to serve in the Marine Corps Reserve. Caitlyn focuses her practice on Family Law including custody, visitation, and divorce. She serves the Beaufort community as a Young Lives mentor for teenage mothers. Caitlyn is an active member of the South Carolina and Georgia bars.